When we reach the farthest generation back in time on a particular ancestral line that we can with all of the data and information we can find after exhausting all of the sources that we can access then genealogists call this point a "brick wall." At that point it's the dead end of that line. Sometimes many years later we may discover another source of information that breaks through that particular brick wall and allows us to extend our research back another generation. We have addressed that type of dead end in previous columns - but this column is about a different kind of "dead end." This is about and old abandoned cemetery - and my quest to locate it. In 1792 an extended family arrived in the United States on the Ship Minerva from Northern Ireland (Ulster), probably originating in County Down. The family centered on a widow Hewitt whose name is unknown. The extended family included the mother, two Hewitt sons, John and James, and four daughters, Margaret, Nancy, Mary Ann, and Catherine. ( A fifth Hewitt daughter, Francis, and a son, William, were apparently married and remained in Ireland.) Catherine Hewitt married Matthew Mayes, Nancy Hewitt married James Hamilton, and Mary Ann Hewitt married John Beatty and the group of settlers included these families. Also, the daughter Margaret was married at the time the extended family left Ireland and the group also included her husband, John Creighton, and three of their children, John, James, and Elizabeth Creighton. Another daughter, Anna Creighton, was born during the voyage on the Minerva before their arrival and another son, Robert Creighton, was born about two years later in Pennsylvania. John and Margaret Hewitt Creighton were my gr.gr.gr.grandparents. The Hewitt/Creighton group initially settled in what was then part of Westmoreland County Pennsylvania and now in Armstrong County near current day Freeport . The area was later described by the family as being near the confluence of the Allegheny and Conemaugh Rivers. That description has confused some researchers because there is no such confluence on current day maps - the confluence near Freeport being that of the Allegheny and Kiskiminetas Rivers. The Conemaugh is a river to the southeast of there that is the primary tributary of the Kiskiminetas River. However, old maps show that in the 1790s the Kiskiminetas was known by both that name and as the Conemaugh all the way to its confluence with the Allegheny. The David Rumsey Historical Map Collection at www.davidrumsey.com is an excellent source that can be very useful in better understanding where our ancestors lived at various times and the state of development in a specific area at the time they lived there. Over the next 25 years, some of these related families lived near McKeesport, PA and later some of the John Creighton family lived in the far western part of Allegheny County, southwest of Pittsburgh. After the state of Ohio was formed in 1803, some of these interrelated people were among the early permanent Ohio settlers. In 1807, John Creighton, Jr. along with the two Hewitt brothers, John and James, and a few others explored the area along the Sandy River in what was then Stark County, Ohio. They found an area for settlement, cleared some land and raised a crop of corn. In the Fall they harvested and stored the corn and planted a crop of winter wheat and then returned to the area near McKeesport, Pennsylvania. Then in the Spring of 1808 they formed a group of settlers to return to Ohio and establish a permanent settlement. James Hewitt and his wife Elizabeth were probably the first of this group to develop a homestead and enter a quarter section of land at the land office in Steubenville. The legal description was the NE 1/4 of section 23 in Township 17 North and Range 7 West. This was along the Sandy in what was then Stark County and later became part of Brown Township of Carroll County when that county was formed in 1832. 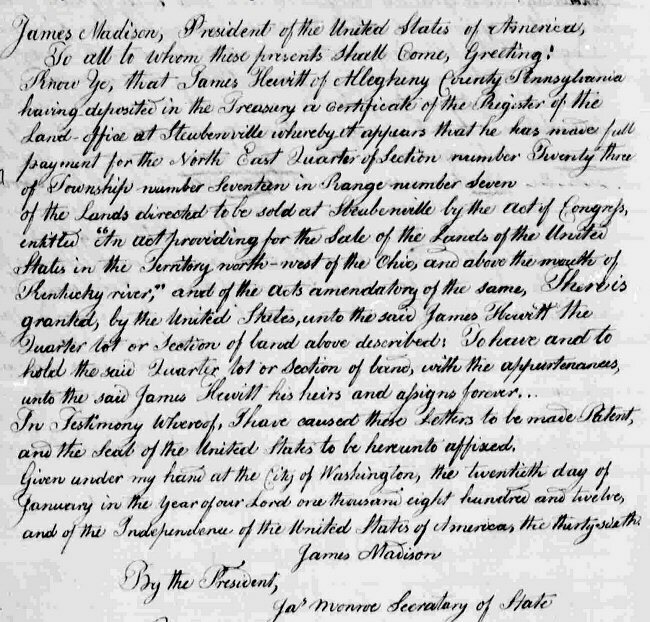 The patent deed for this land was issued in January 1812. In July of 1812 James and Elizabeth, his wife, sold a 1/2 interest in the land to his brother John Hewitt and they jointly developed the farm land. However, John Hewitt died just a few years later in 1817. Over the next several years, most of the members of the extended Hewitt/Creighton families settled in that same area, including John and Margaret Creighton and their son James and his family in about 1817. James Creighton had married Elizabeth Savage, a member of the Henry Savage family of Noblestown, Pennsylvania. They had five children before Elizabeth died in about 1823 in Stark County Ohio. James remarried to a widow, Elizabeth Baker, whose husband had also died in 1823. These were my gr.gr.grandparents. John and Margaret Hewitt Creighton died in 1834 and about 1832 respectively. One of the questions has long been the location of the burial place for the early Creighton and Hewitt settlers in Stark County, Ohio, including John & Margaret Creighton, John, James, & Elizabeth Hewitt, Elizabeth Savage Creighton, and others of these interrelated early settlers. That is the "Dead End" that I reference as the subject of this column. Some of the early settlers in that area are buried in The "Old Pioneer Cemetery" in Waynesburg -including James & Elizabeth Baker Creighton, but not including many of the other early settlers. In the late 1890s, a brief History of Sandy Township was published by James H. Robertson who had grown up there. He was an attorney and later the Mayor of Canton, the county seat of Stark County. There were probably relatively few copies of this 18 page pamphlet printed but a brother of my gr.grandfather obtained one or more copies on a visit to the area in about 1900. He made notes about the Creighton/Hewitt family and others mentioned in the document in the margins of one of the copies and gave it to my gr.grandfather. The original document is still in the family and I made a copy of it many years ago. "Another, and in which some of the pioneers of the Creighton family repose, is located on the farm south of the Sandy owned by the heirs of Wm. D. Robertson, dec."
William D. Robertson was the uncle of James H. Robertson - and James probably had personal knowledge of that cemetery, since he had roamed that area when he was growing up. Old plat maps clearly show the referenced Robertson property to be the NE ¼ of section 23 of township 17 range 7 (now a part of Brown Township, Carroll County) located about a mile east of Waynesburg and about 2 miles southwest of Malvern. That is the same quarter section that was originally entered by James Hewitt in 1812 and a half interest sold to his brother John. When John died in 1817 he was probably the first burial that took place on that property. At some point 1/4 acre was apparently dedicated for a cemetery, since recent deeds list that property as 159.75 acres of the original 160 acres entered by James Hewitt. Recent deeds do not identify a specific exclusion and earlier deeds do not appear to have been recorded. The 0.25 acre difference could result from survey differences but such variances are not normally exactly 1/4 acre. In the 1800s the road from the east into Waynesburg passed over the top of the ridge and through the south edge of that property as shown on old plat maps. That old road was later abandoned and the current Citrus Road became the primary route around the ridge entering Waynesburg from the southeast. If the old cemetery was along that old road, which seems highly likely, it became inaccessible and was abandoned when the road was abandoned. By that time, the Waynesburg Reformed Church Cemetery, now known as the Old Pioneer Cemetery, in Waynesburg had also been used for burials of some of the early settlers. However, it's likely that Betsy Savage Creighton, who died about 1823, John Creighton Jr. and his wives, one of whom died quite young, John & Margaret Creighton, John, James and Elizabeth Hewitt, and others were buried in this other old cemetery on the original Hewitt property. Other researchers have also cited the same reference in the old Sandy Township History to this old burial ground but apparently no one has located any other information regarding it. The original James Hewitt property has been in the Robertson family since the 1830s and is currently owned by Deanna Robertson McMaken and her husband, David and is a part of what is now known as "Rose Ridge Farm." We have communicated with the current owners and they are unaware of any burial ground on the property so it seems likely that there are no remaining stones or other readily visible remains of the abandoned cemetery. It would take some careful on-site searching to locate it. The McMakens are aware of the existence of the old road through the property and say that they can still find traces of part of it. 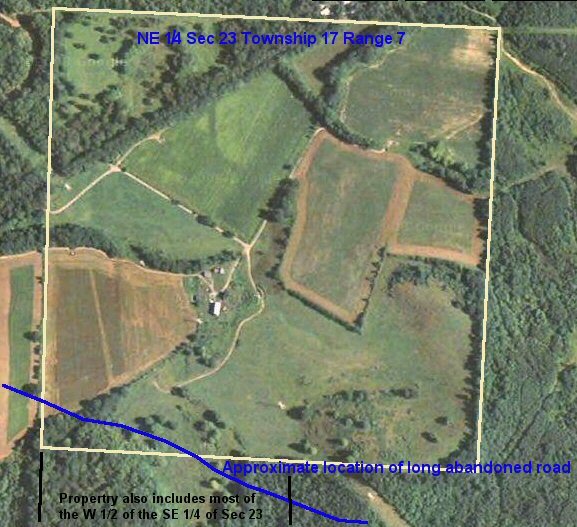 The satellite photo below shows the 1/4 section and the approximate location of the abandoned road that used to pass through it. Since learning more about this abandoned cemetery I've not been able to personally make a trip to that part of Ohio to do any further on-site investigation. I was not yet aware of its location at the time I last visited the area many years ago. The Genealogical Societies in both Stark and Carroll Counties have been informed of what is known about this abandoned cemetery but, so far, they have not shown any interest in further investigating it. Until someone is able to investigate the location in detail this will remain a "dead end" in our research of this family line.